Adjustable Patio Covers, NE. LLC is a partner dealer for StruXure Outdoor, formerly Arcadia Louvered Roof. 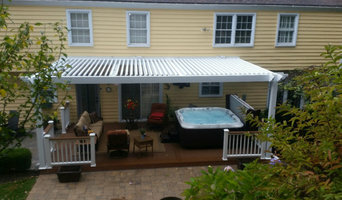 We are the #1 provider of Louvered Roofs in the tri-state area. Simply the BEST Louvered Roof on the market! - Innovators of the modern-day SMART louvered roof - The PREMIUM product of its type in the marketplace - CAREFULLY compare our premium materials & design w/similar products - AKSO Nobel - Premium Finish for Superior Protection - only the best! - Customized to fit any space - Completely framed in for a distinctive finished look www.adjustablepatiocoversPA.com www.struxure.com KEY FEATURES of the StruXure Outdoor "SMART" louvered roof • Our SMART louvered roof can automatically close when it rains or is to windy. Smart phone, tablet or remote control • Protection from the rain when closed • Built in gutter system channels water to where you want it to go • HEAVY gauge powder coated extruded aluminum (compare our material) • Low maintenance - does not rot or rust • Built to withstand severe weather conditions • limited lifetime "transferable" warranty • Made in the USA! The StruXure Louvered Roof is a pergola, an arbor and a solid roof all in one, providing sun when you want it, shade and shelter when you need it! It is the perfect solution for anyone wanting to enjoy outdoor living more days of the year. 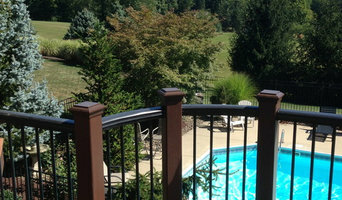 Customize your columns, colors, lighting, fans, pergola end cuts and privacy screens. Our staff works with clients on the design and oversees every project from start to finish to ensure 100% customer satisfaction. Contact us at 724-816-2325 for your free consultation and estimate. MANY APPLICATIONS! StruXure Louvered Roofs have been installed at homes, restaurants, malls, event centers, country clubs, beach and pool clubs, hotels, bed and breakfast, senior living facilities, and other places where people gather to enjoy the outdoors. MORE ABOUT OUR BUSINESS We work with homeowners, outdoor living contractors, deck builders, architects, landscape designers, builders and developers on the design, configuration, application and installation of the Arcadia louvered roof, as well as, other complimentary products that allow people to enjoy their outdoor living space more days of the year. We are conveniently located in Cranberry Township, PA - 20 miles north of Pittsburgh and we service the tri-state area. We also have a showroom in Mars, PA.
SelectDecks is a premier custom deck builder servicing Pittsburgh, Washington and Allegheny Counties, PA, Morgantown, WV, North Central WV, and McHenry, MD, but we don’t just simply build decks. We design, build, and ultimately create outdoor living spaces tailored to your home and style. Whether it be a custom deck, porch or patio, spacious sunroom, breathtaking outdoor fireplace, or blazing fire pit let SelectDecks transform your backyard into an outdoor retreat you never dreamed possible. The owner of Exceptional Exteriors & Renovations Inc has been working in the industry for over 20 years. His philosophy represents excellence and integrity that is unsurpassed in the market place. We know our clients; understand their needs which will enable us to customize the project. The products used and quality of work, we believe is unmatched in the industry. We know that the improvements to our clients’ home will be an asset for many years to come, which is why you can count Exceptional Exteriors Renovations to complete your project with perfection. Douds Bros. Landscape Construction, Inc.
Douds Bros. has been in business since 1995. We are a design/build company. We design and install outdoor living spaces and gardens including: patios, outdoor kitchens, fireplaces, fire pits, pergolas, arbors, landscapes, stone/boulder walls and landscapes, driveways, walkways, paths, and low voltage lighting. The services that we provide are performed by our employees, with an owner on the job site at most times. We are located in Mars, PA, and serve the north hills and surrounding communities. We look forward to helping you to create the most enjoyable backyard in your community, serving Western PA, Pittsburgh, Butler County and surrounding area. If you are looking to bring your outdoor living to life, give us a call at (724) 898-2006 or click the "Contact Me" button to send us a message. We look forward to working with you! *Authorized YellaWood Contractor* Offering home remodeling and deck construction around Pittsburgh for over 57 years with peace of mind installation. 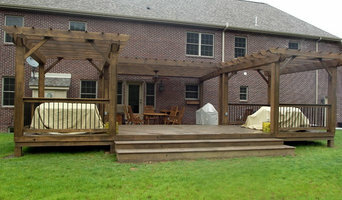 Offering home remodeling and deck construction around Pittsburgh since 1960 with peace of mind installation. Imagine a summer day spent lounging in the sun, or an evening spent with friends enjoying steaks fresh off the barbecue. 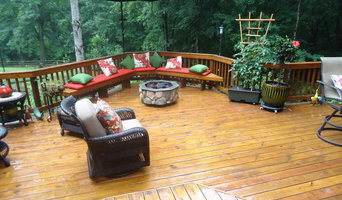 With a new deck from Quaker State Construction, you can enjoy your leisure time in countless ways. Whether your home improvement project is a brand new Sunroom, Screened Enclosure, Porch Roof, Whole House Addition, Finished Basement, a New Deck or Extreme Deck Makeover – Quaker State Construction’s 59+ years of quality craftsmanship takes the stress out of remodeling! F.D. Strano Sales & Four Seasons Sunrooms offers a complete line of patio enclosures, solariums, conservatories and porch covers. With so many styles and options to choose from, we have a sunroom suited for any style of home. We can also help you to install windows and with window replacement . Our quality line of windows, as well as patio doors, sliding doors and French doors include Thermal Industries and Pella. Therefore, if you are looking for vinyl windows, aluminum windows, or wood windows, then you've come to the right place! Thinking of replacing your entry door or storm door? We can help with that too. Wether you like steel or maintenance-free aluminum the custom-made doors we have are exactly what you need. Those looking for the style and elegance of wood doors can opt for the Pella-Fiberglass selection. Dana brings over 38 years of Creative Craftsmanship. He specializes in the following: Design, Engineering, Installation of Distinctive Outdoor Living Spaces, Structures, Elevated Concrete Decks, Fireplaces, Hardscapes, & Landscaping . Rossero Contracting is your go-to resource for home renovation, remodel, and repair needs. Specializing in outdoor decks and patios, as an owner operator I will take the time to listen to you and turn your vision into reality. All of our work is completed to the highest of standards and is not complete until you are satisfied. I am confident that once you have used Rossero Contracting, you will be a lifelong customer and refer your family and friends. Please call today for a free estimate! Your chosen specialist will run through your options based on your available budget and space, and discuss potential stumbling blocks such as building regulations and planning approval. A shed is typically counted as a temporary structure but every planning authority will vary in its requirements and Wexford, PA shed builders can help work through this with you. Many summerhouses on the other hand will warrant planning permission due to their size and more permanent nature. When it comes to patio installation, or decking installation in Wexford, PA, you will certainly find working with Wexford, PA decking installers and patio pavers will lighten the workload and ensure your new garden feature offers a great outdoor space for years to come! You may also want to work with a garden design professional to plan your garden space before engaging a patio or decking installation professional in Wexford, PA. This decision may in the end come down to the space you have available for your garden room. Today, there are many specialist Wexford, PA shed builders that offer high quality sheds in attractive and colourful designs that can easily be transformed into compact outdoor rooms. At its simplest construction, a garden shed is obviously a very useful storage place, whilst a summerhouse typically works as a real garden showpiece, there as a garden room to be enjoyed come rain or shine. And it can be constructed in almost any style you wish. How about a traditional log cabin or something more contemporary such as an energy-efficient modular design or a Scandinavian summerhouse of interlocking construction? Customise your summerhouse with lighting, heating and even internet connectivity depending on the core use, whether that’s a separate workspace, home gym or sun-bathed hideaway. A summerhouse can look overbearing if it’s more than a quarter of the total size of your garden so, again, check with your specialist to see how big is too big. Patios are a great place to entertain friends and family over a juicy barbecue and bottle of wine on a balmy summer’s evening. A patio looks particularly good at the front of a large garden, teamed with cast iron patio furniture, and can be constructed from a number of different materials such as stone, brick and concrete. Your Wexford, PA patio designer or patio installation specialist will be able to plan an attractive patio design which can range from a simple regular tiled layout to complex mosaic patterns. Alternatively, hardwood decking is another great way to bridge indoor and outdoor areas, separated by sliding or French doors. If your garden is lower than your home, consider asking your decking installation professionals in Wexford, PA to raise the deck to the level of the floor so you can step seamlessly outside. And it needn’t be a standard rectangular decking installation either. Go with the flow and add a curved border, accentuated by decking lights. If the kids are making you climb the walls, ask your expert to help you design a low-level play area, painted in bright colours and incorporating a sand pit. No kids? A gazebo or pergola will go well with that timber decking installation – the perfect spot for reading or snoozing. Search in the Find a Pro section of the website for Wexford, PA patio and decking installers as well as shed builders and summerhouse manufacturers. 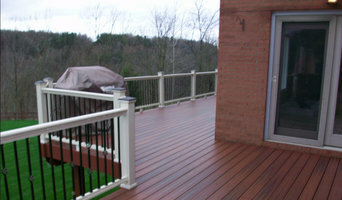 You can also look through Wexford, PA photos to find examples of decks and patios that you like, then contact the decking installation professionals in Wexford, PA who worked on them. Or look for photos of summerhouses or sheds that are tagged with the suppliers information.